Do you need canvas awnings for your home but wondering what benefits come with the installment of canvas awnings? If yes, we are here to help you learn about the top benefits of having canvas awnings. Read to learn about five benefits of canvas awnings today. One great benefit you will gain from canvas awnings, as a homeowner is that it will reduce the heat gain your home endures when the sun hits your windows. Sunlight heats up not only the interior of your home but the glass on your windows. If you think curtains and blinds will help prevent this, think again. Once the sunlight hits the window glass, the heat directly comes into the home. The canvas awnings will stop all this heat gain during the hot days by blocking the sunlight from hitting your windows. 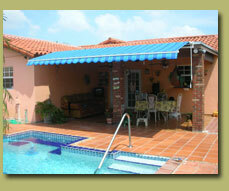 Another great benefit of canvas awnings is improving the aesthetics of your home property. The canvas awnings can dress up your home with solids, stripes and prints, while providing you a warranty on your investment and home value through look and style. A third benefit of canvas awnings is that it protects your window trim and ledges from severe sun and rain damage. It does this by limiting the exposure your windows will have from the sun and rain. You can even open your windows during a warm rain to let fresh air inside your home. You can do this because canvas awnings will keep the rain from your windows at all times. The fourth benefit of canvas awning is that it will keep your furniture in good condition because canvas awnings can prevent your furniture from fading. The awnings can prevent furniture fading because they keep the sunlight from coming in your windows. Canvas awnings can also protect your interior carpet in the same way. Last but not least, a great benefit of having canvas awnings is that it protects your home from storm damage. Canvas awnings can prevent storm damage from hindering your home structure because they work as buffers to storm debris from breaking your window glass. Canvas awnings are very reliable structures – even when your home has potential to be affected by hurricane damage. If you are ready to reduce your home’s energy consumption, and improve your home décor today, let Carroll Awning Company install your canvas awnings today.